6061 T6 Aircraft grade aluminum - This is the most durable motor stabilizer you will ever own. No bending, warping like others can. Attention to detail and only the best quality parts are used in the DD26 Mean Mount including HDPE Grommets that will not disintegrate. Fits 200-300HP MERCURY Pro XS 2-Stroke Engines. 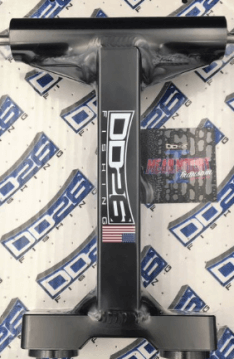 We have DD26 Mean Stop Steering Locks to Match!!! ESTIMATED CURRENT LEAD TIME IS 3-5 WEEKS! PICK YOUR COLOR AND Protect your investment! There is nothing harder on your transom, steering and motor than towing. Let's face it, we love our Boats and Motors and they are not cheap. Do not skimp on one of the most important accessories you can buy for your boat. 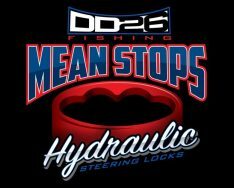 Our DD26 Stops Lock your Hydraulic Steering when Trailering. 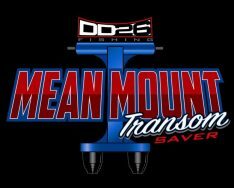 DD26 Fishing has redefined the game when it comes to quality and performance of your Steer Block Stops. The Steer Stop prevents outboards equipped with hydraulic steering from "wandering" when trailering. Units clip onto hydraulic steering rams on both sides of outboard to keep engine straight and prevent damage to motor supports. Fits 200-300HP MERCURY SeaPro V8 4 Stroke, Pro XS V8 Four Stroke and V8 FourStroke Engines. Highly recommended that you pair these with DD26 Mean Stops in order to provide maximum protection to your boat and motor.